South Texas Print Guy offers many types of printing solutions on a contract basis. While we do not have a walk-up retail store, we are able to offer fine and unique printing services to clients on a contract basis. We specialize in full-color envelope printing; including printing letterhead, inserts, items on special papers and materials, and many interesting substrates. We can also do menus, ID Badges, annual reports. Whether you need something printed on heavy stocks, linen or fabric, magnets or most any other unique media, we can tailor a solution to meet your printing and marketing needs. We also offer lamination services, hardcover and softcover binding, vinyl banner printing, removable window-cling, poster printing on a number of rigid surfaces, and many more options. We can print of medias up to 12.9 inches by 47 inches, which allows us to offer highly desired tri-fold and double gate fold brochures and flyers. We’ll accept most any short run job. Please ask to see samples. We’ll be happy to share them. Contact us today to start a discussion on how we can help you get your message across to you clients and future customers. Whatever your needs, we can handle. 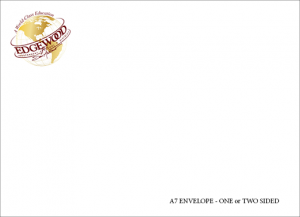 We offer a full-color imprint on the envelope size of your choice. We have affordable options using standard size house stock envelopes, but will do our best to work with the envelope styles and brands of your choice (or equivalent). We can do any size from 3″x5″ to 10″x13″, windowed, non-windowed, Press N Seal, Security, or plain. We offer low minimums and quick turnarounds. We’ll even split boxes for separate logos and return addresses. Simply let us know your needs. Delivery is always free in San Antonio, TX for all orders over $100.00. Need logo or design services? We’ve got your covered with our custom design services. 2-sided edge to edge (bleed) printing is available upon request. Got a special project in mind? Give us a call. We’ll tackle the tough jobs other printers won’t do. Whether you need 1 or 100, we’ll consult with you on your project, give you a price for completion, and get the job done for you. We can print sheet lengths up to 47 inches in length giving us the capability of producing great pieces like 8.5″ x 11″ Tri-fold brochures (8.5″ x 25.5″ unfolded). 12″ x 32″ Vertical Org Charts are no problem. We can print on cover stocks exceeding 130# Cover stock. Ask the others if they can. All of this to let your creativity flow. Obviously, we can’t do it all, but we can do most and more than others. TIRED OF YOUR WEEKLY MAILINGS? We’ve got that covered too. Our Direct Mail services will ease the burden of your weekly mailings to your customers or prospects. We can take your list(s), print your information, fold, stuff, and mail; ensuring a timely and cost-effective mailing. Call us now at (210) 549-7878 to get started.